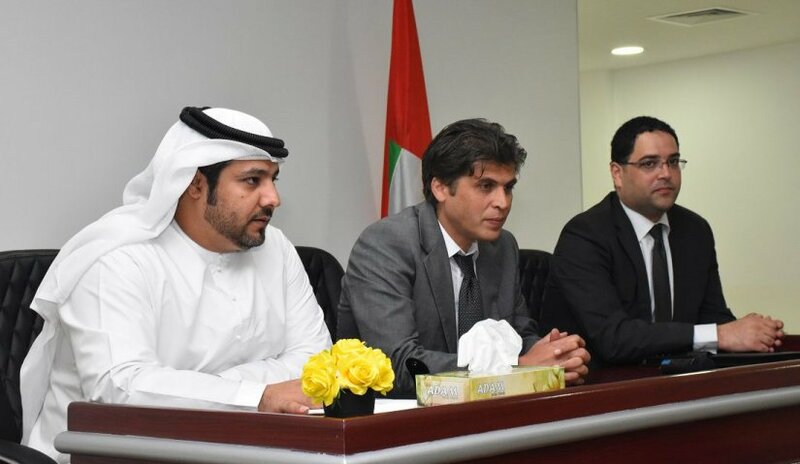 In the framework of the keenness of the Ministry of Youth and Culture of UAE to interact with academic institutions , the ministry organized a meeting with members of the academic and administrative body of Al Falah University to demonstrate the dimensions of the National Strategy to empower young people. Mr. Hashim, the Coordination and External Liaison Manager Strategy explained that the goal of their Department is to interact with the students of Al Falah University to enlighten the students with the ideas of the Ministry of Youth and Culture. He stressed that the strategy is on 12 disciplines aimed at the students of ages 15-34 years. The Ministry has selected 100 young men and women to prepare and equip them through workshops, whereby the Ministry is seeking to conduct field research on thirty thousand young people of UAE to achieve the goal of the strategy and to identify proximity of the problems faced by young people. He expressed hope that he would receive all the cooperation from the authorities and bodies concerned with strategy. The Vice President of Academic Affairs, Dr. Sameer Al Barghouti extended gratitude towards the delegation of the Ministry of Youth and Culture and praised the noble efforts of the Ministry for the youth of UAE. He expressed the keenness of participation from Al Falah University in all the activities organized. The University would stand by the respected Ministry of Youth and Culture and support them in materializing the goals identified.